Sculpture class supervised byStefano Piali, opening hours: Monday - Saturday 10.00 -12.00 a.m. / 4.00- 7.00 p.m. Sunday 10.30 - 12.00 a.m.
Celebrations for the 125° anniversary of the constitution of Firefighters brigade in Marino, sponsored by the Commune of Marino, Stefano Piali has signed the event flyer: The Heroic. National Exposition of Sacred Art "Croce Veliterna" ("Velettri's Cross") Master Stefano Piali participates with "Madonna del Divino Amore" ("Our Lady of Divine"), Carrara marble h cm 70. 68thMichetti Award – "Fantasmi di luce - estetichevisionarie da Michetti al presentenel 70° anniversario del premioMichetti" ("Light Ghosts - VisionaryAesthetics from Michetti to present on 70thanniversary of Michetti Awards"), edited by Silvia Pegoraro. From 16thDecember 2017 to 28thJanuary 2018. The National Painting Award F.P. Michetti was established in 1947 in honour of Francesco Paolo Michetti, a painter from Francavilla al Mare. From 1947 until today have taken part in it 20th century’s iconic artists of various and complex tendencies: from Prampolini to Reggiani, from Sassu to Cantatore, from Ceroli to TitinaMaselli. In 1969, when the awards were banned due to the protests of the time, took part in the exhibition Burri, Capogrossi, D'Orazio, Fontana, Turcato, Vedova; the AbruzzeseSpalletti and Summa; the young Kounellis, Mattiacci, Mochetti, Paolini, Prini, Zorio. Master Stefano Piali took part with the work "Fugadalla Storia" (“Escape from History”) triptyque, oil on canvas 250x150 cm. 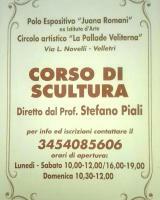 Exhibition at Umberto Mastroiani Civic Museum of Marino 10th year of the cultural association Castrimeniense Academy. Master Stefano Piali takes part with two works: “L’assu’ … un suono …una luce” (Up there… a sound … a light) Oil on canvas 80x180; “Guerrieri” (“Fighters”) Terracotta h cm. 60 (rare example). PerformARS "Dalla superficie alla terza dimensione"
From the surface to the third dimension works in clay running. 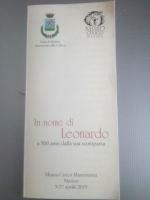 At the Museo Civico Mastroianni in Marino, the exhibition "In nome di Leonardo" was inaugurated. Celebrates the genius of the Renaissance 500 years after his death. Of the artists invited to the exhibition, some have directly revisited the work of Leonardo while others have chosen, from their journey, a more representative work to pay homage to the Master.